In the beginning, our attention is a completely pure canvas that is acted upon or painted by our tendencies within us or the three Gunas. The three Gunas are always present with us, one representing our past, one representing our futuristic sense and one representing the present. (For more information, see Character Tendencies). And as we’ve discussed, the three Gunas correspond to our energy channels and reflect tendencies within us. Whatever our life experiences have been, they’ve been recorded in memory. Take the color black, for example… all the aspects of our experience that are associated with the color black (e.g., emotional associations and specific manifestations of the color black, for example, at a funeral) are recorded in memory. Subsequently, seeing the color black may trigger old memories associated with black. Those memories load into our attention; they’re painted on the canvas. As soon we become aware of these old associated memories in our attentional space, our attention gets muddled up. Our attention may even be colored or biased by all the old memories associated with the color black. And, next thing you know, we take action according to how our attention was influenced. For example, if we associate black with a funeral, we may feel sad and melancholic. We may begin to ruminate about the past. There is a potential for this phenomenon to happen at any moment in our consciousness. We store memories about everything that slides into our attention…situations, people, things, emotional reactions or links and associations to things and people — everything. Whether it’s about the future or about the past, everything is projected out onto the canvas of our attention. This creates our temperament, referred to as vritti in Sanskrit. So attention both helps drive our temperament and is dependent on it. From a spiritual perspective, this is not an optimal state, as it also enables our habits and addictions to cling to us. We have strong conditionings and recollection of how to perform a particular activity and what result it will produce. Once these recollections become firmly imprinted in memory, we form strong, difficult-to-break habits. Long-conditioned reward-motivation brain circuitry kicks in. And all this happens because we’re still in a state where our attention is controlled by our temperament, and memories that have been reconsolidated over and over again, thanks to our attention frequently retrieving them. At this point, memory can be said to be stronger than our inner self. The optimal state of spirituality is to be able to realize the Inner Self through the process of Self-Realization and begin to feel it strongly through the activation of the subtle energy system. Our attention is taken to the higher state of the collective unconscious, well above the state where it can be repeatedly influenced by memories and associated thoughts. It’s almost like we can observe our attention and thoughts from a higher level; indeed, during the Sahaja meditative state of thoughtless awareness, we can do just that. Not only that, we’re able to notice our attention traversing into different realms of consciousness, which gives us an opportunity to take corrective action. We have complete control of our attention. Now the inner or spiritual self is much stronger than memory and we’re said to be spiritually evolved. This is the state where all our undesirable habits, behavior, conditioning and egoistic drives fall away and we experience what it feels to be, quite literally, a free spirit, released from the chains of our own enemies within. We first become fully aware of our tendencies (Gunas) and eventually, in the longer term, overcome them. We move from the Tamasic to the Rajasic to the Saatvik states. The progression, of course, is never quite that linear. In the short term, we always oscillate, depending on the tendencies that are dominating us. Furthermore, the Tamasic and Rajasic tendencies are not all bad. After all, we must some emotional energy and some futuristic abilities to lead a content, productive life. But the trick is to achieve the right balance, and we accomplish this through awareness and right action — noticing when we are veering toward extremes and correcting ourselves through attentional control. Having achieved the balanced Saatvik tendencies, the next step of the journey is to develop each successive state of awareness or consciousness and the qualities associated with each corresponding chakra. This is described in depth in the section Practitioner’s Journey. When the attention moves to the higher state of consciousness or the collective unconsciousness, we receive positive spiritual and divine energy into our attention and our chakras. This automatically nourishes our chakras and causes the basic essence or quality associated with the chakra to automatically percolate and establish itself in our spiritual being. When we develop the ability to constantly and regularly reach the state of super consciousness or collective unconscious, we continue to improve our personality more and more, and almost automatically or innately. The ultimate stage of spiritual evolution is dwelling permanently in the collective unconscious. This is exactly what yogis living in mountains and secluded caves thousands of years ago achieved. They reached a permanent stage of heightened spiritual existence wherein their attention resided in the higher realm of consciousness, allowing them to achieve a permanent connection to the divine. In such a state, the physical state of existence of their bodies did not matter. Their consciousness was completely subtle and their existence was purely in the realm of the divine — permanently in nirvana. In practicing Sahaja, we actually touch the state of nirvana, even on Day 1, but only sporadically. The biggest challenge, then, becomes holding our attentional focus there as long possible. From a personality development standpoint, most of our efforts are devoted to trying to stay connected to the super conscious and strengthen our connection to it through regular meditation. This, in turn, causes the qualities of each chakra to permeate and become firmly established within us. This is very different from exerting a deliberate mental effort towards personality improvement, where we focus our minds on a specific goal and train ourselves to exhibit positive qualities. 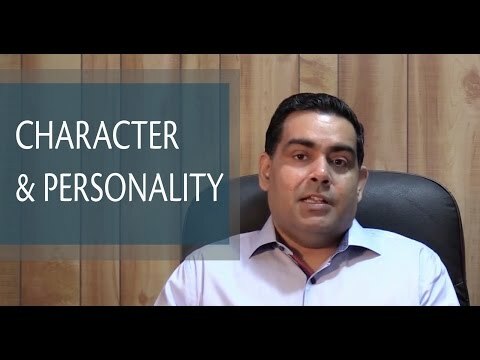 With respect to improving character and personality traits, such efforts may not only be limited in terms of outcomes, but can be extremely difficult to achieve. Unless there is an innate source of internal power that’s driving the change, transforming personality traits can be really difficult. The easier way to do it may be through meditation, specifically through the state of thoughtless awareness. Thoughtless awareness causes us to ultimately transcend these three tendencies (gunas) to a state described as Gunateet in Sanskrit, meaning “beyond the Gunas,” or that our tendencies and our character and personality being driven solely by them are a thing of the past. This state goes well beyond the state where we’re vulnerable to being dominated by any of the three tendencies, Saatvik included. It amounts to complete mastery over our tendencies, not easy to achieve on a sustained basis, but definitely possible as a lifetime evolution.